We are offering an exciting and diverse selection of Teen Spanish camp options. Our signature Spanish and Surf Camp, offered in Playa Tamarindo, Costa Rica, is still the only one of its type in Latin America. Our Spanish, Service and Turtle Rescue Camp based in Turrialba is a fantastic immersion and service opportunity that really makes difference in the world. Our Spanish and Adventure Camp combines immersion Spanish with exciting and adventurous afternoon activities. We also offer 2 other unique camps, our Travel Camp and our Spanish & Surf Expedition. Our Service and Turtle Rescue Camp and our Surf Expedition are two week camps where all of the students arrive and depart on the same days. This allows for a greater sense of purpose and group cohesion. All other camps can be done by the week and are stand-alone options, so students can easily and seamlessly mix and match experiences. Teens traveling with their parents can join our camps as a Day Camper. Day Campers participate in every aspect of the camp from 8am to 5pm, Monday through Friday, but they lodge with their parents, eat breakfast and dinner with parents, and the weekend tours are not included. We believe that learning the language has to do with more than just class time and homework. For this reason, the school offers two different cultural activities each week. Examples of these are Latin cooking classes, Latin dance classes, Spanish movie night, trips to nearby beaches, afternoon field trips to local markets with instructors and half day tours. By helping students learn more about the Latin culture we believe they are going to learn more Spanish. With the teen surf expedition the only lodging option is the camp lodging. Which is, we take over a small lodging complex next to the beach for our teen camp lodging. There are four shared rooms, with three or four beds per room, with private baths. We have communal kitchens and a chef that prepares breakfast and lunch for the students. Dinner is usually out at a local beach front restaurant. 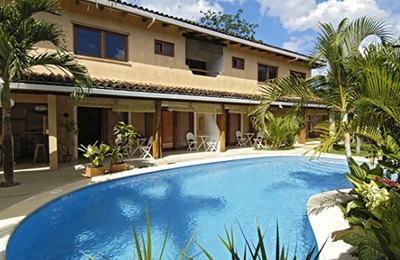 Homestay is offered in the towns of Villa real and Santa Rosa, which are located 4 and 6 kilometers from Tamarindo. 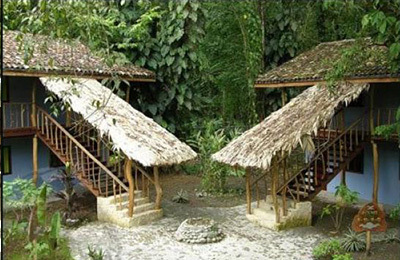 The houses are small, clean, comfortable and fairly rustic. 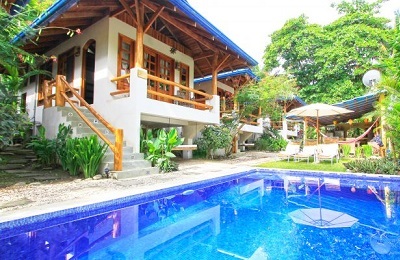 Included in the homestay option are: a private room, shared bath, breakfast, dinner, laundry service. Free high speed wireless internet access. We provide all transportation each day to Tamarindo and then back. Breakfast and dinner are with the host family, lunch is with the other campers. The On Campus School Residence is on the third floor of the school building. There are two dorm style rooms each with a/c, private baths with hot water and showers. Student will have access to two balconies overlooking the ocean, a large common area and a communal kitchen. During the weekdays, the large common area, one balcony and the kitchen are used for Spanish, yoga and cooking classes. However at night and on the weekend, it is for the private use of the students in the residence. Free high speed wireless internet access. The Off-Campus Superior option is located a 5 minute walk from the school and has shared rooms with a/c, swimming pool and communal kitchen. Free high speed wireless internet access. The other option is for students to do the camp as a day camper. This means that they stay with their own families, not with the camp or at a host family. They only participate in the camp activities from 8am to 6pm, monday through friday. The only meal that is included in this option is lunch, the others are with their families. The entire second floor is made up of clean, modern air-conditioned classrooms with glass outside walls that let in plenty of natural light and affords students in class, gorgeous views of the ocean. Each of the classrooms on this level is perfectly suited for both small group and private language instruction. The top floor of the building houses our On-Campus Student Residence, yoga studio and additional classrooms. Free high speed wireless internet access. The camp is located in the town of Turrialba, which is located 1 ½ hours away from San Jose in a beautiful mountain valley. There are 35,000 local residents and it is an extremely safe city, with very low levels of crime. It is the major cultural and commercial center for the surrounding region, offering a main hospital, numerous banks, shops, stores and restaurants. The main thing is that it is NOT a tourist town, with very few locals speaking English. This makes Turrialba a culturally and linguistically immersive location. Our private language institute is located in the hills overlooking the town and the picturesque river valley. Spanish classes are in the morning from 8am to 12:30pm, Monday through Thursday, for a total of 16 hours/week. Students are broken up into small group classes by level of ability, from abject beginner to nearly fluent. Experiencing local family life is a large part of this camp and great care is taken when choosing these families. Only families who have worked with us for more than five years and are willing to accept the added responsibilities inherent with housing teenagers are considered. Students share two meals a day with their host families. Students are placed one or two to a family, by request. Service, volunteer and environmental protection is the major focus of this camp. Monday and Wednesday, students volunteer at local orphanages, schools, churches and senior centers. During the middle weekend, the Camp will visit the Caribbean coast and participate in a Sea Turtle Rescue and Habitat Restoration Project. The final weekend we will volunteer in a remote mountain co-op community, dedicated to sustainability. By participating in needed projects we will improve the lives of those being served. Costa Rica is an amazing tropical paradise full of exotic animals and adventure tours and cultural activities. On our first day, we will raft down through pristine primary forest on the exhilarating Pacuare River, hike in the jungle and zip through the forest canopy. Turrialba is a typical Costa Rican pueblo of over 40,000 people in a mountain valley on the Atlantic Slope between the colonial capital Cartago and the Caribbean coast. The area surrounding the town is rural with verdant green mountains, river valleys, farms, coffee plantations and rain forest. The school itself is located in our own compound on the hill overlooking town and the valley. We are just a 10 minute walk to the Central Park and very close to all of our host families. It is one of our most beautiful school settings in all of Costa Rica. The Turrialba area is very Tico (Costa Rican) and few people speak any English, so it is very immersive and safe. 1½ hours from the capital city, San Jose. It is a very safe and accessible town with none of the traffic and congestion of the capital. Three rivers crisscross the valley with a large man made lake about 10 minutes outside of town. The temperature in Turrialba is very mild with daytime highs in the mid 80s and nighttime highs in the mid 60s. 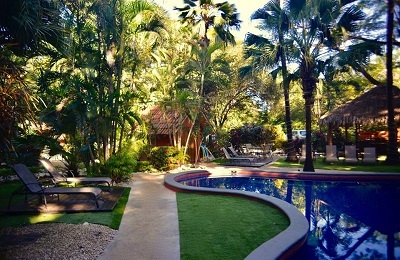 In Costa Rica, we offer the pick-up service in conjunction with our Student Guesthouse. We recommend that you arrive on Sunday and go directly to your host family. The cost of lodging options is the same and includes the same services, meals, laundry and camp transportation. Children’s Long Term Discount: $25/week off! the Children’s Camp Price when the student attends for three or more weeks. Sibling Discount: If two or more siblings sign up to attend our camps at the same time, they will each receive $50/week off! their Teen Spanish camp (residential or day camp) and $25/week off! the Children’s Spanish Camp. Neither the Early Sign-up Discount nor the Teen Long Term Discount (free airfare) can be combined with any other discount. "Costa Rica is sweet! Thanks everyone for my birthday surprise … that I missed! (oops). The “Winnie & Tigger” pinyata on Sunday was a blast … the coconut cake was yummy … balloons and party hats … thanks for the fish! You guys are like a home away from home! Take care, and God Bless… "
"Dana and Marjo, you guys have made the beginning of my trip 100x better than I imagined. It’s nice to know that there are great people, doing great things, whenever you might need then. This has been a tremendous adventure, one that I will never forget…except when I start my business and “forget” that you came up with the idea! Peace, love, and serenity." "Dana and Marjo, I returned from Costa Rica about a month ago and I’m sorry it has taken me so long to write you my thanks. I appreciate your assistance in locating a school and my experience in Turrialba was excellent all the way around, for me and for my two daughters. Dana, your support in getting the trip ready and choosing a school was invaluable, and Francini, your help while I was there was greatly appreciated (I talked with Carlos Cambronero and he was very helpful). In the future, when looking for Spanish language schools, I will keep you in mind and (already have) recommend(ed) you to others looking for a place in Costa Rica to study Spanish. Sincerely,"
"I love being invited to your parties. That doesn’t mean you have to invite me to all of them, but if you do it’s OK! Hope your stay here, no matter if long or short, is the best time of your life." "What a fantastic place!! I’m so impressed with the staff and everyone who has helped me out here! (In fact, I was so impressed – I joined the team!) Thanks for all your hospitality Hugh! I’ve had a blast (…carrying the “coffin,” getting stuck in the “cage”…twice…), but I’m sure the best is yet to come! "